Language Log » Left to right or right to left? your life will have no way out." you can hope to get rich through MLM." This is exactly the opposite message that the authorities wanted to convey. 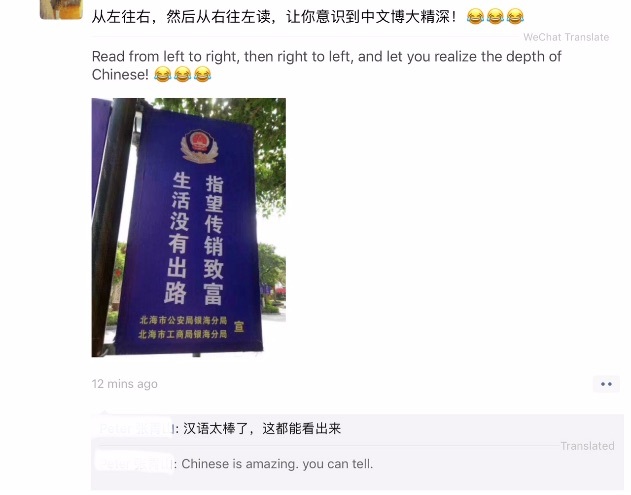 I’m intrigued by the way it’s being applauded as an example of the exceptional nature of Chinese. My wife (a Chinese) couldn’t explain whether the reversible layout of the text was likely to have been deliberate or not. I would assume that the designers knew what they were doing and wanted to make the message eye-catching. What do you think? I, and most Chinese I know, think that the municipal authorities made a stupid mistake. 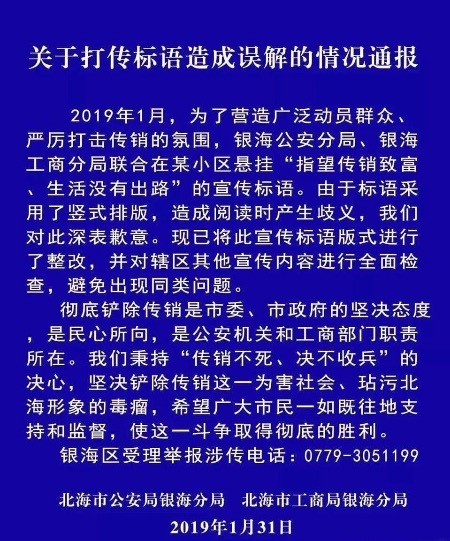 Two days ago, after news of this blunder went viral on social media in China, the Beihai authorities removed the offending signs and issued an apology, averring that that they were at war against MLM and were determined to eradicate it from society. So, is the ambiguous nature of the orientation of the Chinese script great or not? I've noticed a number of examples (informal) where Chinese have adopted the incorrect direction when writing vertically. Essentially, the decision last century to convert to horizontal writing (to match 'international' practice) has caused a large number of (Mainland) Chinese to lose touch with their own roots — in Taiwan they still use the old orientation. MLM is very very very brainwashing. I have a friend whose relative was lured to MLM, and his relative was literally captured into that brainwashing camp until his parents and wife came to that camp and took him home. However, he hated his parents for that, because he believed in the magical power of MLM. MLM will make you believe that you are a member of this MLM family and you need to get more people into this family. Those MLM groups don’t usually have a decent product, but earn their money through involving more people who have no hope in life, no motivation for hardworking. The slogan is very witty to some degree. But I wonder whether that would be of any use to those who have been brainwashed. I believe paratactic conditionals have been discussed before on LLog – I remember there was a post about a sentence along the lines of 没有共产党，没有新中国 and how it confused learners. I assume that Beihai is in the 白話 (Cantonese)-speaking area, but suspect that is not the cause here. 为/危 are both input as 'wei' in Roman letters in computer input systems. It is possibly just a careless conversion choice. A friend posted a short poem with illustrations for each line as a series of blog comments. However, I had my blog reading software set to display newest-first, so I saw them in reverse order. Both orders turned out to make sense (the lines in the poem have a strong stand-alone quality) but not quite the same sense. I found the effect so charming that I now want to make wall plaques, one per line/illustration, and mount them in a hallway so that which poem you see depends on which direction you're going. 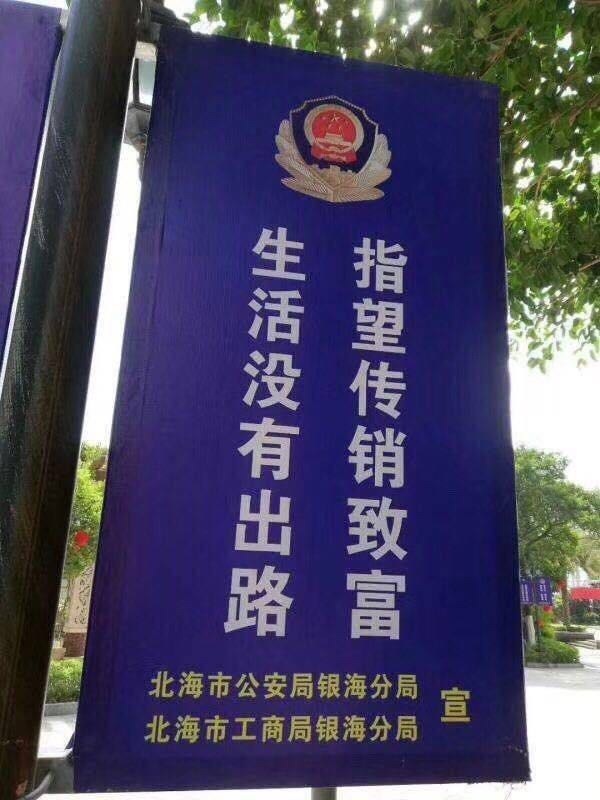 My wife (far more capable in Chinese than I am) points out that the text at the bottom reads left to right, which could incline readers to read the whole poster left to right.